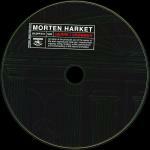 The second single from "Vogts Villa" was also released as a radio promo only 1-track CD-single. The cover has a bluetoned black and white photo of a smiling Morten taken from the same photo session as the previous single along with a text box to the upper left with titles and credits. The inner sleeve has a photo of the Vogts Villa building. The CD is of similar design as the album and the previously mentioned single.